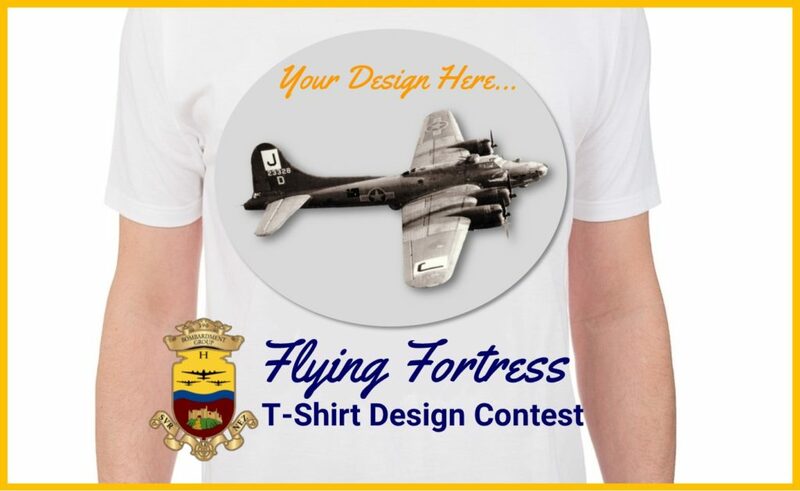 The 390th Memorial Museum is now accepting design submissions for an official museum Flying Fortress T-shirt, which will be reproduced and offered by sale in the museum store. With almost 200,000 people visiting the 390th Memorial Museum each year (not including website visitors), this T-shirt will be seen widely by guests from around the world. If you have design talents and would like to submit artwork for a chance to win a cash prize and a feature story in the Museum news and store, please read below for more information. The 390th Memorial Museum is entirely unique and personal, highlighted by the B-17 aircraft “I’ll Be Around” and centering on the experiences of the veterans of the 390th Bombardment Group and their service to the nation in World War II. To learn more, visit www.390th.org. Anyone can participate (including professional designers), however, you must be 18 years or older. Minors creating designs must submit through a parent/guardian. Museum volunteers are not eligible to participate. The deadline for submissions is 4:30 p.m. on March 1, 2019. The winning design will feature imagery related to the B-17 Flying Fortress. Designs will be judged blind (the artist names will not be known to the judges). The winning design will be announced on March 15, 2019 and the designer will be awarded a $150 cash prize. The design will be showcased in the Museum’s store (including the online store). Recognition will be given via a feature story linked onto the Museum’s website news; the Museum’s e-newsletter, the Museum’s quarterly newsletter; and on the Museum’s social media pages. Additionally, the feature article will be printed and posted in the Museum. Submit designs via: museum@390th.org (subject: T-Shirt Contest) by 4:30 p.m. on March 1, 2019. Submissions must include the name and contact information of the designer. If the artist is a minor, a letter of permission from the parent or guardian should be attached. Please submit JPEG files. Files should be under 5MB with the largest dimension at 1,000 pixels. If your design is chosen you will need to supply a high-resolution (300dpi minimum) or vector image for production purposes; all entries must be digital submissions. By submitting a design, you acknowledge that the artwork is wholly original, does not incorporate or include any material that would require the consent of any third party and does not violate any copyright, trademark, publicity right, privacy right or any other right of any third party. The 390th Memorial Museum reserves the right not to select a winner if, in its sole discretion, no suitable entries are received. The 390th Memorial Museum also reserves the right to edit, composite, scan, duplicate or alter the design for any purpose which it deems necessary or desirable, without the need for any further compensation and/or permission. By entering the contest, you grant permission for your design to be used by the 390th Memorial Museum any purposes they deem necessary. Submissions that are not selected will not be retained past the date a winner is announced.